A Federal Reserve policy mistake is our top risk this year. Correction: The mistake is already happening. So that’s less a forecast and more a recognition of reality. The Fed is raising rates and reversing its quantitative easing. At the same time! They should be doing one or the other, not both. The media and investors focus on the rates. But as you’ll learn, the global balance sheet reduction may be even more harmful. If Jerome Powell doesn’t realize this in early 2019—or the rest of the FOMC disagrees with him—2019 could get rocky, and very quickly. But the Fed’s experiment is not the only risk I’m worried about for 2019. Let’s look at a few things that crossed my inbox in the last month and piece them together. … the POTUS is right to criticize the Fed’s policy actions, but for the wrong reasons. The fixation of markets and the financial media on whether the FOMC raises the target rate for Fed funds or not is misplaced, part of a time-worn policy narrative that is completely antiquated. Since 2017, the only important trend in credit markets has been whether the Fed’s balance sheet is shrinking and at what rate. The move in credit spreads that started in August signaled that there is a growing problem with liquidity, yet the FOMC ignored the warning. To use a metaphor, the Fed’s QE left the economy addicted to a highly potent drug. Removing this addiction without a crash is impossible. And yet its supply is disappearing. Rate hikes are secondary here. In real terms, short-term rates are still close to zero. Even if the Fed keeps hiking, they will stay historically low. The QE reversal is much more impactful. Worse, it’s not just the Fed that is reducing its balance sheet. The BAJ, BAE, and ECB are in the same boat. Another problem is the corporate bond market. To put it in a quaint and polite term, it’s gone berserk. Companies are more leveraged than ever. And yet investors still lend them more. Low rates made debt capital less expensive than equity. Borrowing has been cheaper than issuing stock for the last decade. That’s how many businesses funded themselves. The problem is artificially low prices stimulate malinvestment. You might think today’s highly paid CEOs are immune to that. But many are not. Most of them put their companies in debt to fund share buybacks at double or triple their current stock prices. Lenders were equally foolish. They felt forced to take credit risk due to low Treasury rates. Many went too far. 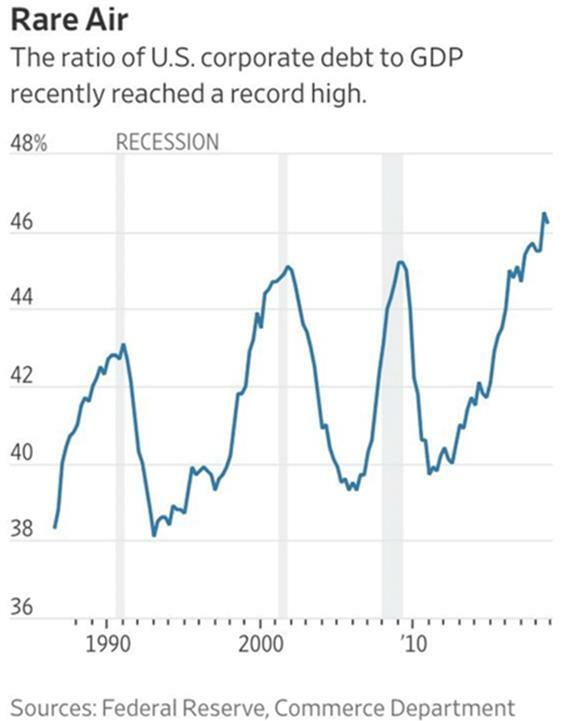 The result: Corporate debt as a percentage of GDP is now at a record high. And as the chart below shows, debt at these levels tends to end with a recession. Worse, a lot of this debt is in mutual funds with legally mandated daily liquidity. If more investors want their money than the fund has cash on hand, they must instantly liquidate assets at whatever price they can get. This can quickly snowball into a financial crisis. Something similar happened with commercial paper in 2008. But this has the potential to be even worse. Because it could come at a time when the Fed and Treasury can’t help much. Given this, I see serious risk of a corporate bond crisis in 2019. It will likely begin in high-yield and leveraged loans, but won’t stop there. We’ll also face new political challenges. With Democrats now in charge, there will be no more tax relief. But there will be a lot of other drama as they investigate and resist the Trump administration, which is their right. How the president will navigate this is not yet clear. I am not optimistic. The mostly likely outcome is (at least) two years of legislative gridlock. However, that may not stop Trump from using executive authority to continue his trade war—especially with China. Beijing simply can’t give everything Trump wants without crashing its own economy. Maybe there is a compromise somewhere. I’m sceptical, though. Tariffs may go back up and further bite into US growth at a time we can least afford it. Multiple central bank policies, the run-up in high-yield corporate debt, tariff and trade wars, political battles, government shutdown. These are the risks I see this year. They are all unforced errors, every one of them. The economy might be able to ignore them individually. Together? It is a witch’s brew for upsetting the applecart.